A 53-pound king salmon was the catch of the day for three top chefs who competed for the best salmon recipe in this year’s sixth annual Copper Chef Cook-off. Congratulations to this year’s winner Ethan Stowell of Staple & Fancy and Tavolata. Stowell competed against defending champion John Howie of Seastar Restaurant and Raw Bar and Eric Tanaka of TanakaSan. Hungry yet? Download the chefs’ 2015 Copper River salmon recipes here. The three culinary craftsmen will have 30 minutes to prepare and serve the freshly caught salmon to a panel of four judges including Seattle Seahawks’ first and legendary quarterback Jim Zorn; Seattle Mariners Hall of Famer Jay Buhner; Seattle Storm President and General Manager Alisha Valavanis; and Alaska Air Cargo’s Managing Director Betsy Bacon. Three Seattle chefs greet 2015’s first cargo shipment of Copper River salmon, flown in from Cordova, Alaska. Ethan Stowell plates his salmon dish. John Howie with a fresh fillet of Copper River salmon. Ethan Stowell, John Howie and Seattle Mariners Hall of Famer Jay Buhner. 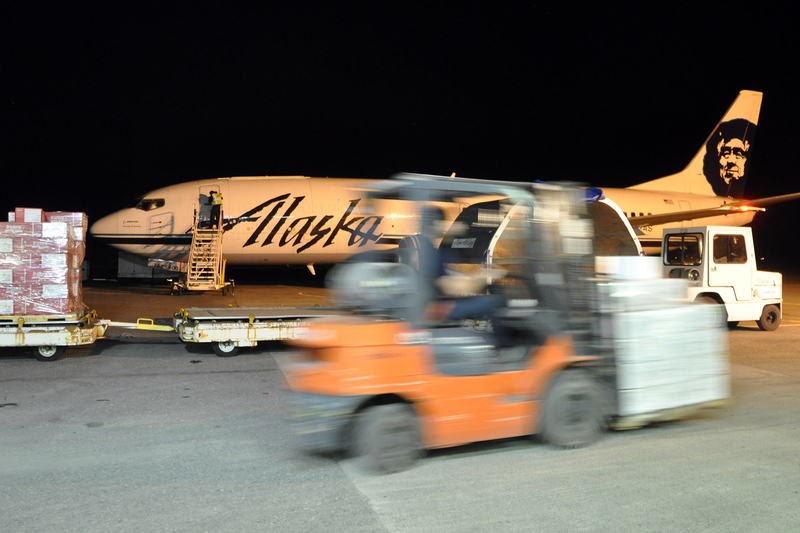 Alaska Air Cargo employees unload the season’s first cargo shipment of Copper River salmon. Trident Seafoods provided this year’s cook-off fish. The salmon has landed! A fish-filled jet touched down at Seattle-Tacoma International Airport shortly after 6 a.m. today, carrying 18,000 pounds of wild Alaska Copper River salmon. The 737 Combi is about to depart. Tonight’s flight crew is First Officer Peter Michels, Captain Larry Packer and flight attendants Bobbi Danielson and Stacy Brabham. The celebrity fish gets to ride jumpseat with the pilots. Seattle has a huge appetite for Copper River salmon, and we’re bringing home enough for everybody. Last year, Alaska Air Cargo flew 1.2 million pounds of Copper River salmon out of Cordova — a fish for every fork! The first flight of the night is bringing home 18,000 pounds of fish, followed by another 30,000 pounds on the freighter. Here are some of the Alaska Airlines employees in Cordova who worked around the clock to make it happen, fresh and fast. The Alaska Airlines Boeing 737-400 has arrived in Cordova. It’s scheduled to depart at 2:15 a.m. local time and arrive in Seattle about 6:15 a.m.
Alaska employees are busy loading the boxes of fresh fish. Many employees worked a shift earlier today, then went home and napped before returning about 11 p.m. to work until morning. A second aircraft — Alaska’s 737 freighter — is scheduled to arrive at 4 a.m. to pick up more Copper River salmon for Seattle. From about 7:30 to 9:30 p.m. Thursday, a long line of gill-net boats returned from the fishing grounds with Copper River king and sockeye salmon. Families watched from the breakwater and greeted them as they came home. “To a lot of Alaskans, Copper River salmon means summer is here,” said Shannon Stevens, Alaska’s seafood cargo sales manager but better known as the Fish Lady. “It’s better than being the Fish Witch,” Stevens jokes. The gill-net boats are starting to arrive back in Cordova with the season’s first catch of Copper River salmon. “There’s huge, huge pressure for the guys right now to catch as many fish as possible,” said Kyle King, an Alaska Airlines employee in Cordova whose dad is a commercial fisherman out on the water today. The next stop for the salmon is the processor, where they will be boxed up. Cordova has about five major processors, and fishermen decide which one to go to. Some boats unload at docks, while others unload at tenders anchored offshore, pictured above. Sunset tonight in Cordova is at 10:18 p.m. – more than 17 hours of daylight. Here in Cordova, about 500 boats have been out on the water fishing since 7 a.m. for their Opening Day catch of Copper River salmon. The boats will begin to return after the 12-hour fishing window closes at 7 p.m. Cordova time (8 p.m. in Seattle). It’s an exciting time for the town of about 2,300 people. “Everybody in this community is somehow tied to what’s going on out there right now,” said Brad Sjostedt, an Alaska Airlines employee in Cordova. The 2015 Copper River salmon season opens May 14 in Alaska, and just a few hours later, Alaska Airlines will fly the first catch of the prized fish to Seattle. 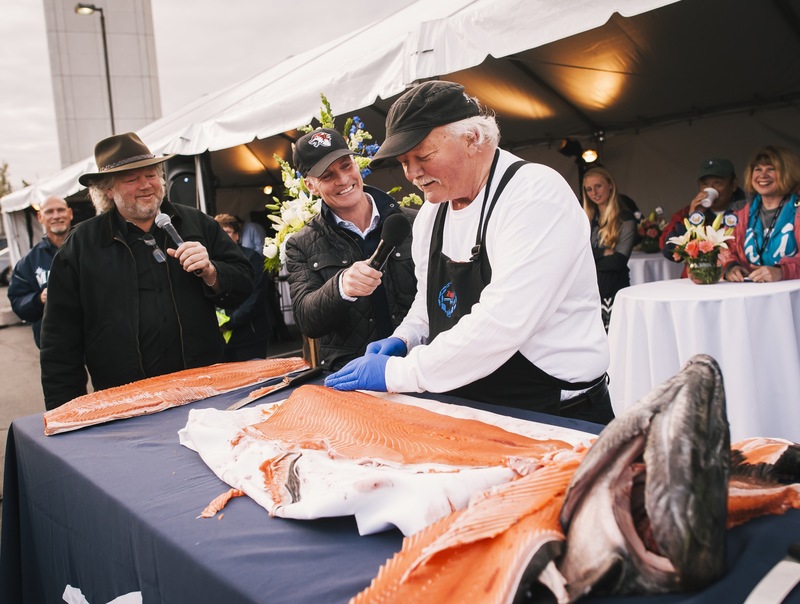 In an annual rite of spring, Alaska Air Cargo delivers the season’s first Copper River king salmon straight from the waters of Southcentral Alaska. It’s scheduled to arrive in Seattle early Friday morning, May 15. Soon after, fresh Copper River salmon will start to show up on restaurant menus – and dinner plates – throughout the city and beyond. This year, we’ll be following the first fish and documenting its journey from the Copper River to Seattle. Check back here for updates starting Thursday or follow #copperriversalmon on social media. WHEN IS COPPER RIVER SALMON SEASON? A Copper River king salmon (also called a Chinook) can grow up to 50 pounds or more, according to the Copper River Marketing Association. Copper River salmon must travel 300 miles from the ocean, where they have spent their adult lives, through rugged terrain and icy waters to reach their spawning grounds, a journey that requires extra stores of energy in the form of fat, according to the Copper River Marketing Association. It is this fat that not only creates the exceptional flavor and texture of Copper River salmon, but also the high levels of omega-3 fatty acids that make it so healthy to eat. 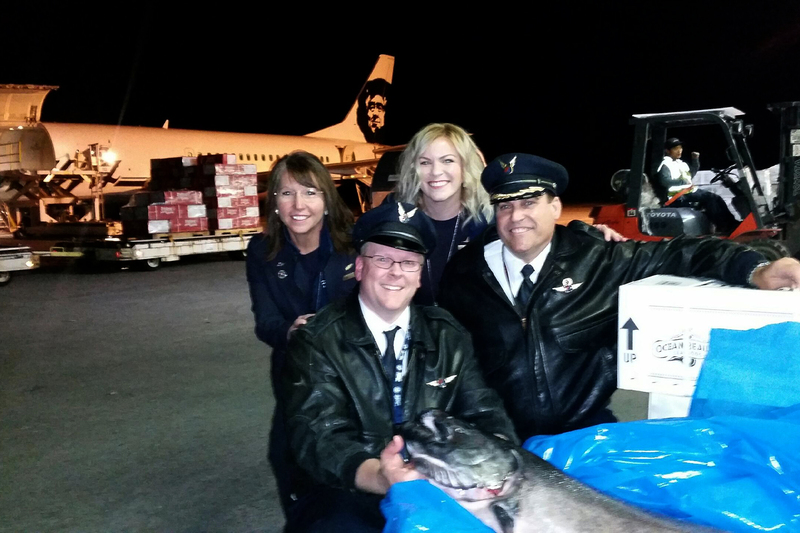 HOW DOES ALASKA AIRLINES KEEP THE FISH FRESH DURING THE FLIGHT? Copper River salmon shipped on Alaska Air Cargo this season will arrive as fresh as possible to grocery stores and restaurants across the nation, thanks in part to a cool chain training program required of all airline employees who handle perishables. Employees follow strict seafood quality standards and pass an annual food quality course. The goal is to keep seafood moving rapidly throughout its journey on Alaska Airlines and maintain a consistent temperature range from the time it leaves the water to when it arrives at stores and restaurants. 1 comment on "Follow the fish: Copper River salmon season is here"